If just putting the 2 words, Chennai and Marathon, is not crazy enough, I actually ran The Wipro Chennai marathon (TWCM). The run was organized by a group of running freaks – The Chennai Runners. The timing for holding the race was perfect. December is the coldest Chennai can get. This time it was right before the onset of the return SW monsoons. As I type this it’s pouring in Chennai, and I can imagine how different this report would have been, if the monsoons were 2 days too early. Would have turned out like the Chicago marathon which Dharam ran. 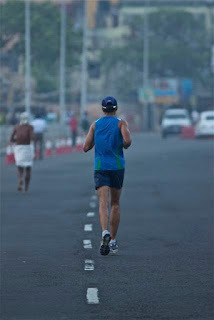 Chennai’s got pancake flat roads, so much in contrast to the Hyderabad marathon course I ran in October. To counter the heavy morning traffic of Chennai, the Chennai-runners did a good job of getting the last 10miles of the course inside IIT campus. All communications were handled well. The Expo at EA Mall was low key but very functional. I was in and out within 10mins. The goody bag could have been stocked better – no juices, face washes, biscuits or chilly powder! Personally I only cared that I had the timing chip and the personalized bib (with my name on it). Since water stations didn’t come very frequently (was still ok), they surely should have had Electral. Glucose is not as efficient to replenish salts as is Electral. Kilometer markers outside IIT were being placed at 6AM, while we were running on the course. Since it’s a challenge to get this labor to come in at 4am to place the markers, it’s best done late night, the previous night. If I didn’t have my Garmin GPS, I would have had no way of pacing myself. There were no mile markers for the first loop inside IIT, the deficit (above) was over-corrected when the 36k mile marker reappeared, with 34.3km on Garmin! The course, esp outside IIT was well planned. Absolutely loved the flat sections, well traffic regulated roads, beautiful Marina Beach with the entire Beach Road blocked for runners – on both sides, Mind it! Chennai runners / walkers inside IIT campus, making way, clapping and cheering on faster runners on narrow and winding course. I even had a “appadi podu” moment, when some of them put off one ‘see tee’. As the full marathoners finished, there were kids from a Charitable trust, who waited with medals for us. Those kids are the real heroes. No waiting in line for refreshments / medals for full marathoners. Personally, the training was not the greatest. 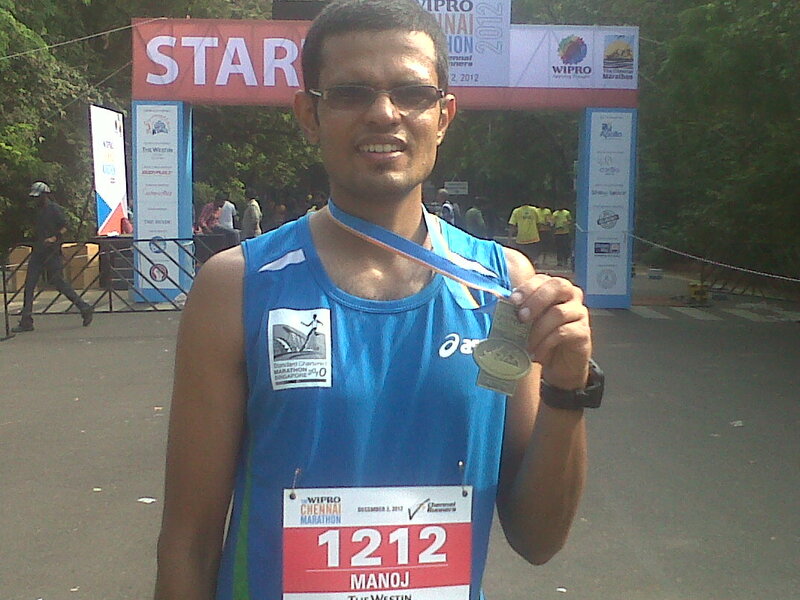 I had to dig deep for motivation after the PB at AHM, for I didn’t expect to better AHM at Chennai. With, “expecting” beginning to mean other things in life, the focus was surely not on my running performance. I had picked up training about 2 weeks after AHM. And although, the weekly mileage dipped to 40km for 2 straight weeks, I did not miss the quality workouts of the Jack Daniels training program. The last few weeks leading up to the race day, boosted the confidence up. I scaled down from a target of 3h:17m (as per my current V-dot) to a 3:30 to 3:40 finish. Since it was a flat course, the plan was to run at a constant 5:05 min/km pace for as long as I could hold, and maybe slow down to a 5:15 pace for the last 10k or so. I rode my father-in-law’s new Vespa, and got to the Gajendra circle within IIT campus, well before the 5am start time. The only familiar faces were Sampath, Chandra Sr. and Sumit. I wasn’t left with too much time for the warm up – just about 5mins or so. The race started on time, with some 200 odd full marathoners in the fray. I locked in into the 5:05 target pace even before I got out of the IIT campus. Barring one mini-flyover, the course was flat. Oh, the beach road section was fab, the entire road was devoid of traffic and looked very inviting. At caught up with the bare-chested, barefoot runner, Viswanath, popularly called Hubli Passenger on this stretch. With about 16k done in good time, the spirits were pushed as high as the lighthouse I was passing, when I heard my father-in-law cheering for me. He had made his way through the traffic blockages, to be on the course, handycam and all. He ran alongside for a few hundred meters, capturing me on camera. As I entered IIT campus for the last 2 loops inside campus, the mile markers read 2k extra compared to my Garmin GPS, I prepped myself up for running a 44k marathon. The section inside campus was good too, except for the numerous turns on the course. The slower runners were courteous and made way. I had to use my vocal chords as much as my leg muscles to bellow the “coming through”s. At 36km, there was a surprise package – a near 2k discount, with the mile markers suddenly showing 2k more than the Garmin. I tried to remain indifferent to them, but was running very steady at this point. I passed another veteran A N Subramanian, around then. I was able to hold on to pace right to the finish line. The official finish time is 3:27:57s placing me in 5th place overall. After collecting my medal from one cute school girl, I ran a couple of loops within the stadium so the Garmin would read the distance as 42.2km! A great race to bring down the curtains for a great running year. Thanks for all your support and encouragement and staying with me. See you all next year, with more PBs and more fun runs! Superb timing, Manoj. Congrats on the top 10 finish. Dharam ran California International marathon. BTW, you ran Hyderabad in August not October, duh! And btw, Chennai doesnt have pancake roads. It has dosa roads, LOL. 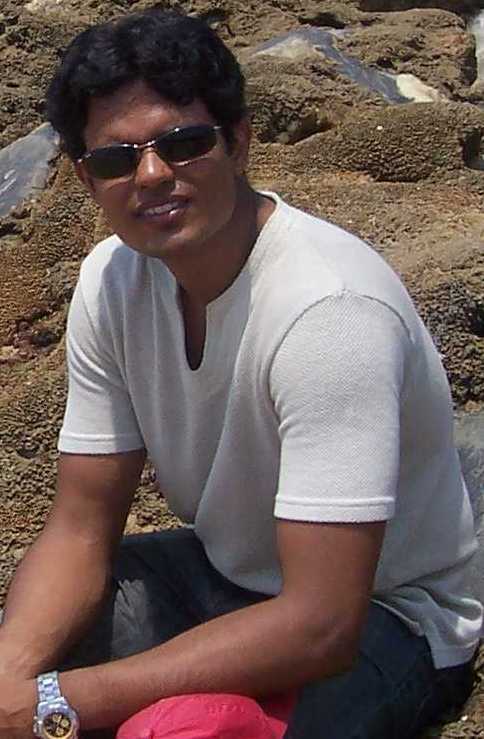 Thanks for your information and now i shared my own website fixbooker.com. It is had all details about Hotels in Bangalore, bangalore hotels, Best hotels in Bangalore, 5 star hotels in Bangalore, hotels in bangalore india, Resorts in Bangalore, hotels in bangalore india near mg road.